The Dayton Regional STEM Center recognized 4 area teachers at their Annual STEM Banquet on May 13, 2015 for their dedication to STEM Education through the STEM Teacher Excellence Awards. Mr. John Ciprian of Thurgood Marshall High School was honored for his Community-based Collaboration in educational initiatives. 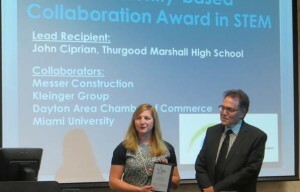 As such, John called attention to the community collaborators Messer Construction, Kleinger Group, Dayton Area Chamber of Commerce and Miami University for their efforts to support STEM Education at Thurgood Marshall. Ms. Katie Henry of Brookville Intermediate School was honored for her efforts in School-based Collaboration. Ms. Henry recognized her collaborating teachers Anne Drake, Becky Fultz, Sarah Gulley, Teresa Huelskamp, Jill Lenser, and the Brookville parent group for their efforts in supporting the creation and implementation of a STEM after school programming attracting hundreds of Brookville students. Additionally, the STEM Center recognized two teachers for their efforts in Leadership and Service to STEM Education. Ms. Beth Allaire from Bishop Leibold was recognized for her tireless efforts in the building STEM classroom programming, after school enrichment programming, a family science festival, and supporting 1st-8th grade teachers in incorporating STEM learning experiences within the traditional classroom setting. Mrs. Kim Puckett from Tri-Village High School received first place for her leadership and service to STEM Education. Mrs. Puckett was recognized for her outreach efforts to K-12 educators, education stake holders as well as business and industry professionals. Mrs. Puckett’s relationships have fostered numerous professional development and student opportunities in the STEM fields. As the STEM Center continues to support the national and local STEM Education community the administration also recognized an individual with a Friend of STEM Education Award. This award was presented to Dr. Vince Russo. Dr. Russo has worked with the DRSC since 2009, when he initiated a middle school student summer aviation experience called Air Camp. He continues to be an innovator for STEM learning experiences leveraging his professional expertise and network to strategically focus funding and efforts on high-impact STEM learning experiences for both teachers and students. As such his creativity, support and energy have positively influenced numerous DRSC initiatives including grant funding opportunities. The DRSC is grateful for his unwavering support and tireless efforts to support high-quality STEM Education. To learn more about the Dayton Regional STEM Center Teacher Excellence Awards check out our website every January for details regarding the application process. Award recipient’s school/districts receive a financial prize in the awardees name to support future STEM experiences.